Mine water inrush from coal seam roof is one of the serious disasters that threaten safe production of coal mines. Identification of water inrush source and water inrush pathway is a key task for preventing and controlling such mine water hazards. A water inrush accident at approximately 1316 m3/h occurred at no. 3301 working face of Xinhe Coal Mine in Shandong Province, China. 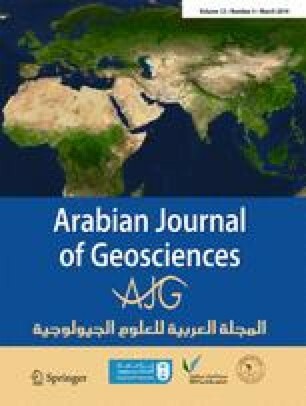 Multiple lines of evidence including characteristics of mine water inflow rate, dynamic monitoring data of water levels in different aquifers, geochemical fingerprinting, and drill hole core examination suggest that the water inrush source originated from the overlying Lower Quaternary porous aquifer with calcite cementation. Structural analysis and numerical simulation with FLAC3D indicate that a low-angle fault, DF49, and mining-induced fractures provided the pathway for the water inrush. Mining activities made the fault hydraulically conductive and connected to the Quaternary aquifer. The numerical simulation demonstrated that the water-conducting fracture zone in the coal seam roof extended to the fault. Groundwater gushed into the mining area from the Quaternary aquifer via the combined pathway of the activated fault and mining-induced fractures. Presence of the fault in the overlying formations played a critical role in occurrence of the water inrush. Results from this case study can be of reference to all coal mines with faults or other geological discontinuities present in the overlying formation. These discontinuities may significantly extend the height of the mining-induced water-conducting fracture zone in the roof and thus increase water inrush risks. The online version of this article ( https://doi.org/10.1007/s12517-019-4325-0) contains supplementary material, which is available to authorized users. The authors would like to thank technicians in the Department of Geology and Survey in Xinhe Coal Mine. We thank anonymous reviewers for detailed comments on the draft, all thorough reviews that greatly benefited the manuscript. This research was financially supported by the National Key R&D Program of China (No. 2017YFC0804101), National Natural Science Foundation of China (Nos. 41402250 and 41702305), Graduate Science and Technology Innovation Project of Shandong University of Science and Technology (No. SDKDYC180319), and Taishan Scholar Talent Team Support Plan for Advantaged & Unique Discipline Areas.